on Excavation/Sewer Line Repairs & Replacements. *Mention this coupon at the time you schedule your appointment. Cannot be combined with any other discounts or offers. When it comes to superior quality plumbing services at honest, affordable prices, there’s no one better than Affordable Rooter. Since 2000, we’ve provided a full range of plumbing, sewer, excavation and drain cleaning services to residents of Colorado Springs, CO and the surrounding areas. We care about our customers and always work to address your needs to the fullest! Any plumbing issue—no matter how big or small—is a disaster that no homeowner wants to deal with. That’s why it pays to have a plumber in Colorado Springs, CO you can trust for comprehensive, complete service, no matter the trouble with your plumbing system. From something as simple as a blocked drain, to a problem as complex as new sewer line installation or repairs, Affordable Rooter is here to be your first choice in plumbing. Our Master Plumbers in Colorado Springs, CO go above and beyond to assess the scope of any plumbing issue, and work tirelessly to provide you with solutions that are thorough, sustainable and, above all, affordable. We’re pleased to boast an A-plus rating with the Better Business Bureau! We offer honest, upfront pricing at all times and aim to stay competitive in our offerings. We’re a family-owned and –operated business, here to make a living, not a killing! Come to us for second opinions on excavation/sewer line repairs. We can work with your insurance company regarding a claim. 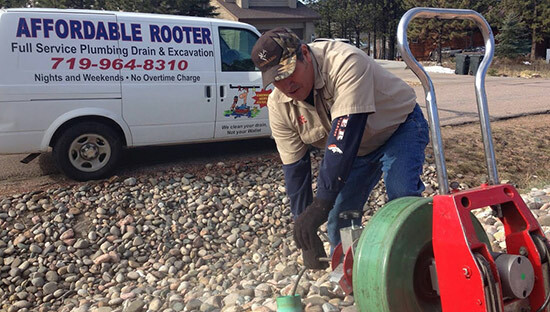 If you’re dealing with a plumbing or septic situation that requires a qualified, comprehensive solution, get in touch with Affordable Rooter today! We’re here to remedy any problem. Proudly serving Colorado Springs and the Mountain Community since 2000! Some outlying areas may require a minimum fee for travel. 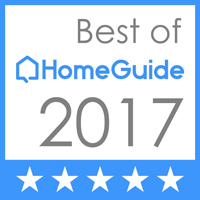 "My furnace repairman had to leave his truck and backpack his gear down my snow-covered and slippery road to fix my furnace. What a hero!!!..." "I was having drainage problems again with my old sewer lines backing up due to tree roots invading the old pipes. Robert and his team had he..."
April 25, 2018 Gail P.
"All the drains in my house (built in 1956) stopped running yesterday morning, so I called Affordable Rooter. Chad had an opening and was abl..."
"The best rooter company on the market! We had used them in the past to have sewer lines unclogged but this time it turned into the repair of..."
"Professional knowledgeable fair and honest!! Great tech Troy!"